Mulatto is a sweet, tame black-and-white girl who had been stuck in this cypress tree for one night. The small limbs on this tree provided very uncomfortable footing and no place to rest. When I arrived, I found her here resting her belly and back legs over a tiny branch which must have been very uncomfortable. She had to alternate between standing with discomfort on her feet or resting with the discomfort of a small branch digging into her belly. The strain of this in the hot August days left her exhausted, panting and dehydrated. All of the limbs of this tree were very small, but I found one up very high that was substantial enough to hold my weight. 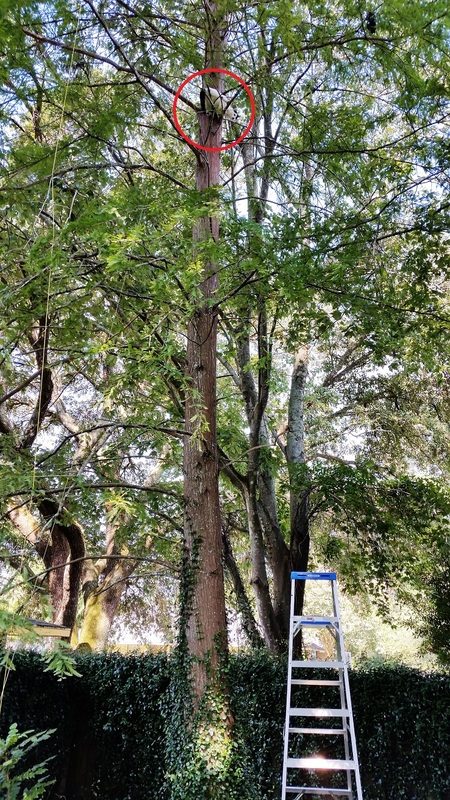 There was not much room to weave my body around and through all the closely-spaced branches, but Mulatto was only about 18 feet high, so it would not be difficult very long. Fortunately, Mulatto was not afraid of me and allowed me to approach her and pet her. Since she was friendly, I wanted to entice her into a carrier with food. During the time it took me to get her food ready, she moved around a bit and was in a position that was too uncomfortable for her to have any interest in food. In the process, I made the mistake of temporarily resting the carrier on the limbs of the tree without securing it. It was good that it was there, because as she moved again, she lost her footing and could have fallen had her feet not found the top of the carrier below her. With the strain of it all, she could not hold her full bladder any longer and just had to let it go. I see this every now and then. 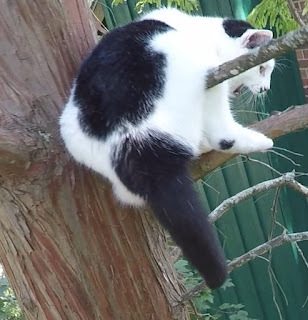 Cats do not want to pee in the tree because they can't cover the scent from up there and don't want to attract any predators. So they hold it as long as they can bear, and then they just have to let it go. When they do it, I am almost as relieved as they are, because I know they must surely feel so much more comfortable now. With her lack of interest in food and her feet resting on the carrier, I decided to rush to scruff her into the cat bag instead. In hindsight, I wish I had just lifted her back feet onto a branch and given her a chance to walk into the carrier. Even without food in the carrier, it would have surely been a welcome, inviting sight to her with all that expansive level space to step on and lie down. I had difficulty getting her into the bag. She clung to a branch, and I had difficulty getting the bag around her while I was losing my grip on her. Had she struggled more forcefully than she did, I could have lost her. I managed to get her inside the bag, but it took longer and more forceful struggling than I like. In the process, the unsecured carrier was pushed off its limbs and fell to the ground. No harm was done, but I should have prevented that by securing it. Mulatto is down, safe and in good hands. She lives in a family of two veterinarians, but they were out of town when she got stuck in the tree. Fortunately, their pet sitter is a very responsible vet technician who took the initiative to find me as quickly as she could in spite of the bad advice she received to the contrary from several others. In fact, she was so responsible and competent that this is the first time that I have ever had someone waiting below all prepared and ready to give fluids to the cat as soon as I brought her down. Yes, Mulatto is in good hands. After the owners returned home, I learned a little more about Mulatto's interesting life. She was abandoned at the age of 2 with a broken leg at the animal hospital where one of the owners worked. The clinic took her in, treated her and kept her while her leg healed. She stayed at the clinic for nine more years often donating her blood for the other cat patients as needed. At the age of 11, she was too old to continue donating blood, so her owner brought her home for retirement and a more normal cat life. She is having a great life, and it is an honor for me to come to the aid of a cat that has herself brought aid to so many other cats.